Making A List…. And Checking It….. Never? I often wonder how Santa could have been so organized and successful at managing his “list” when most men I know avoid lists at all costs. If I had to bet, I’d say that it was, in fact, Mrs Claus that was making a list and checking it numerous time throughout the year. I only say this based on my own experience of list creation, management and maintenance. You see, hubby seems to have an aversion to writing or using lists for just about any circumstance. I, on the other hand, am a dedicated list maker. I make task lists.. which could include things like: go to the bank, buy stamps, pick up dry cleaning, make a dentist appt. etc.. I guess it would be fair to say, that I’m on list overload. 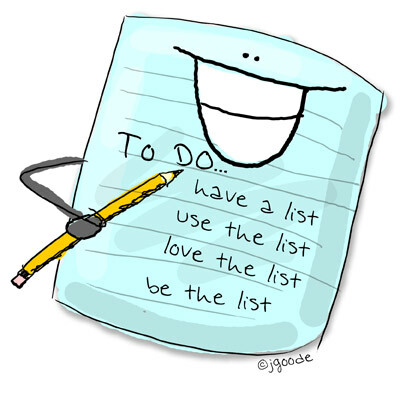 I get it, not everyone is as list crazy as I am… and by no means, do I expect hubby to adapt to my over-zealous list addiction. HOWEVER, I’m hard pressed to understand why he wouldn’t take advantage of my compulsive behavior. The interesting thing here is, that more lists I make, the more hubby is apt to run screaming from my organized plans. Case in point, I mentioned yesterday that hubby used my grocery list when he went begrudgingly on his yearly trip to the supermarket… this, my friends, is a rarity. What happens more frequently is that hubby stumbles on a need we have in our house. This could happen randomly and unexpectedly and then BAM! he comes home from work one night with a box of toothpaste. “Cause I didn’t use the list. I saw this morning we were running out of toothpaste so I stopped at the store during lunch and bought some”. He’s proud of his initiative! Do you celebrate the effort… or do you scratch your head as you cross walk into the kitchen to cross “toothpaste” off the list? And, it’s not just shopping lists that he seems to avoid at all costs. This past weekend we were having a handyman stop by to do some work for us. As we were discussing his arrival, I merrily declared… “Ok, let me make a list of everything he needs to do”. To which hubby replied “I already have a list”. ooohhhh…. ooooohhhh, I’m excited to hear this!. “You already have a list? Great, can I see it?”. He says “Nope, you can’t see it, cause it’s all up here.” as he taps the side of his head……UGH! I thought we were getting somewhere and dippy here, is hiding away his “mental list” – as if writing it all down would somehow leave his head even more empty than it already is. You’d think he’d be happy to have another box in his head that’s filled with NOTHING! (if this makes no sense visit this post HERE). But no, he’s stashing away all his secret lists… most likely to ensure that I’m not able to add anything to them!!! Anyhow, he confidently declares that he doesn’t need to write anything down since he won’t forget anything. And, I bite my tongue as I want to remind him that if he “remembered everything” we have enough soap to shower tomorrow. But then I realize, that this is a futile argument since hubby would be perfectly ok with washing his entire body with shampoo …. and I chalk this one up as yet another battle that I will never win. I’ve been incredibly busy this week ….. again. 40 Days, 5 Weekends, 1 Blog Post, 12 Loads of Laundry, 137 Reminders and……. YES! 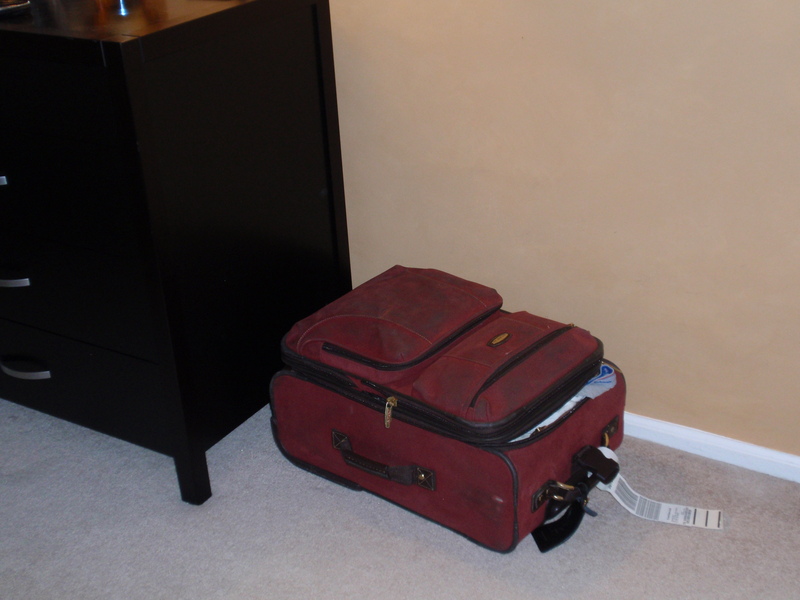 That's hubby's suitcase from our vacation in March! Well, Christmas is over and I’m sure there are a wide variety of stories that I could share with you but I’d like to start by sharing a gift that provided our family with hours of entertainment. I like to call it the Men’s Excuse Book … you’ll understand more in a second! This gift was given to me by hubby’s uncle. This particular uncle is pretty much an exact replica of hubby (perhaps even ramped up a notch or two). I can do nothing but offer sympathy to his poor wife (who should probably start her own blog!). Anyhow, this lovely, well thought out and generous gift, was an eye-opening little book actually called: The Good Wife Guide – 19 Rules For Keeping a Happy Husband. Now let me set the stage a bit, in case you are unfamiliar with the educational value of this little treasure (a version of it has been circulating over email for a while). This book includes excerpts from Ladies’ Homemaker Monthly. This journal (from the 1950s) is a testimony to old-fashioned family values. Their most notable adage was “You can judge a good woman by how many well-dressed children she has and the contentment of her husband”. This book is apparently fantastic fun for parties.. where you can watch all the men beat their chests as they bond together in public, each one knowing that when they get home their wives are gonna kick their butts! I should also probably mention before I dive into some of these gems…. that hubby & I are EQUAL partners in our house (sometimes one of us pulls more weight, but eventually the pendulum swings back the other way – assuming of course that he’s actually listening to what needs to be done!?) That being said, hubby never passes up on the opportunity to try to tell me how to “Be A Better Wife”…. Gotta love him! 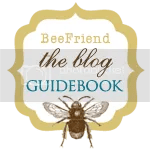 So, while I could spend hours outlining the helpful passages from this guide, I’ll just pick a few of my favorite helpful hints to ensure a happy marriage! And my personal favorites…. which I’ll actually type out completely because I know you’ll truly enjoy them! Who Needs Harmony In The Home? These titles more accurately portray why anyone would write such absurd suggestions. Each & every “rule” provides an excuse or perhaps a pass for a husband’s crappy behavior! It does indeed however, provide a good laugh. And the funny part is, that it illustrates the women of the 1950s were struggling with all the same issues that I tend to write about in this blog! Too bad they didn’t have the internet back then so they too could vent about all those wonderful male traits! And even more apparent, is the fact that men haven’t evolved in any way over the last 60 or so years! How Sad! !